The Kindle Keyboard is controlled by a keyboard that 26+ little alphabetic keys, plus some control keys, that you press to type in a book name, search terms, or select something, or whatever else you might need to do. 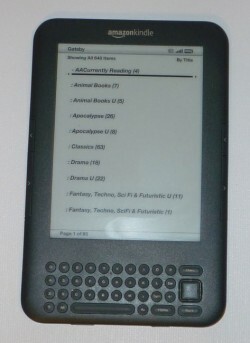 The Kindle Fire is touch-screen, so a touch-based keyboard appears on the screen whenever you need to type something, and all the controls except for the on/off switch are controlled by touchscreen controls displayed on the screen. On the Kindle Keyboard, you turn pages by pressing one of the buttons on the side edges of the device. On the Fire, you swipe or tap the screen. No big deal either way, I find both ways equally easy to use. Swiping and tapping cause screen smudges on the Fire, of course. On the Keyboard model I never have any reason to touch the screen, so the screen stays virtually smudge-free. 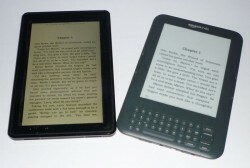 The Kindle Keyboard is black-and-white only, with E Ink technology, so reading onscreen is extremely similar to reading a printed page with actual ink on actual paper. The Kindle Fire is backlit and full color, so it's more like reading a computer screen. The Kindle Keyboard, when I bought it, was available with either wi-fi only or with wi-fi and 3G. (I got the wi-fi only model, but I think Amazon is phasing out the wi-fi only model.) The Kindle Fire is not yet available with 3G, so it's wi-fi only. Wi-fi only means that in order to get a book (or an app, or anything else) onto your Kindle, you either have to be within range of a wireless network, or you have to use a USB cable to transfer stuff directly from your computer. 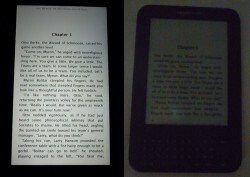 The devices are pretty the same size, but the Kindle Fire is a bit thicker and heaver than the Kindle Keyboard. So the Fire is a little less comfortable to hold for long periods of reading, unless you have something to prop it up on. Both are lighter than most paperback books and lighter than any hard-back book, so the weight of the Kindle Fire isn't something to really worry about. The Fire also has a larger screen, since the Keyboard model dedicates some of its physical space to the keyboard. Those are the most basic, most obvious, differences between the two models. But when it comes to actually using them to read actual books, there are many differences in capabilities and usage, however. I wish I could combine the best features of the Kindle Keyboard and the best features of the Kindle Fire into a single device, a Kindle Keyboard Fire. Then I'd really be a happy camper. But since I can't do that, let's take a look at those differences and what's good and what's not-so-good about each model. The Kindle Keyboard lets you organize your books in collections. The Kindle Fire does not. The Kindle Keyboard has "Collections." You can organize your books into collections — by author, by genre, by books you've read and ones you haven't yet read, by fiction vs. non-fiction ... by whatever method(s) you prefer to organize your books. I have mine organized by genre, primarily, and I have two collections for each genre: Read and Unread. When I finish a book, I move it from the Unread collection to the Read collection for that genre. I also have some collections by author, for my favorite authors. Using collections makes it easy to find a particular book, or to browse for what I want to read next. I'm in the mood for historical fiction? I go to my "Historical Fiction-Unread" collection and see what's there. I'm looking for that last Randy Wayne White book that I read but I don't remember the title? I go to my "Randy Wayne White-Read" collection, and there it is. You can file any given book in more than one collection, so I can put my Randy Wayne White Books in my Randy Wayne White collection and my Weird Florida collection. The Kindle Fire doesn't have Collections! Ugh! I'm not sure I'd have bought the Fire if I knew that! All I have is this long, long undifferentiated list of hundreds of books. I can order them by title or by most recent, and I can see the list of all books I've bought for my Kindle or limit the list to just those that are actually downloaded to the Fire. But I can't browse by collection, or see just unread books. I can't even reverse the order of the list — instead of newest at the top show oldest at the top. If I want to see the oldest books on the list, I have to scroll down dozens and dozens of screens to get to the end of the list. I find myself picking up the Kindle Keyboard just to browse my collections to decide what I want to read next. Then I might switch to the Fire to actually read the book, but I have to use the Keyboard model first to find it. The Kindle Fire gets a big fat F for No Collections. When I'm browsing among books downloaded to my Kindle Keyboard, there's a menu option to view the book description in the Kindle Store. So a book that I bought a couple of months ago that I don't quite remember what it's about, I can easily find out. Or from within a book, I can hit "Menu" then "Book Description" and get the description. It takes me exactly 2 clicks. Three if I have to turn on wireless first. The Kindle Fire has no such option. I have to go to the Kindle Store as a separate action and then type in the book's name. How ridiculous is that??!! First I have to tap the screen to bring up the menu, then tap "Home," then tap "Books," then tap "Kindle Store," then type in the name of the book, then tap "Go," then wait while my Fire finds the book, then find the book in the list that comes up and tap the name of the book. Finally I can see the book description. It's ridiculous that's not a feature on the Fire. For any book in the Fire's library I can tap-and-hold to get a context menu that allows me to add it to my favorites or download it. Why is there not a third option there to "View book description"? Both Kindles let me buy the book or download a sample, browse through books in the store, etc. I was hesitant to get the Fire because I kept hearing people complain that the screen has too much glare and you can't read it outside in the sunlight and so forth. I confess that I haven't taken my Fire to the beach, but I sit outside on my front porch every afternoon and read for a while, and I'm usually reading on the Fire, and I really don't have any trouble with glare. Granted, if I shift in my chair the wrong way, so that the afternoon sun is streaming over my shoulders directly onto the screen, there's glare. But in general it's not a problem. It's true that the E Ink screen of the Keyboard model has virtually no glare and the Fire is susceptible to glare, but it's not terrible. If I know I'm going to be reading out in direct sunlight, I'll grab the Kindle Keyboard. The Kindle Keyboard has text-to-speech and the Fire doesn't. I don't use that feature, so it matters now a whit to me, but if you want text-to-speech you want the Kindle Keyboard. You can read the Fire in a dark room without any external light source. The Kindle Keyboard is just like a book, though: You need light to read. The Kindle Keyboard, being E Ink, has no inherent lighting. You can't sit in a dark room and read your Kindle Keyboard without some source of light. My solution to that was to purchase the Kindle cover with a built-in light. It's a perfect, simple solution that means I always have a light source available to read my Kindle. The Fire, being backlit, doesn't need an external light source of any type. The screen is so bright that when I read in bed I use the touchscreen control to dim the brightness of the screen. You know how if you wake up in the middle night and you can't get back to sleep and your eyes have been shut for hours, if you turn on a light it hurts your eyes and you have to squint and you can't actually focus on anything? A problem I discovered with the Fire is that if I wake up in the middle night and I can't get back to sleep and I want to read, I can't read on the Fire because the screen hurts my eyes. On the Fire with its backlit screen, you're looking directly at the light source. I found that in that situation, no matter how low I dim the screen it's too much to look at. The built-in light on the cover of my Kindle Keyboard shines a nice glow onto the screen and not directly into my eyes. So middle-of-the-night reading after I've been sleeping for a while has to be on the Kindle Keyboard. The Kindle Keyboard has a beta-version web browser. It's sucky, it stinks, and it's black-and-white only. After a couple of experiments with it, I never use the Kindle Keyboard's web browser. The Kindle Fire has a very capable full-color web browser. And mail program. One of the reasons I like to grab my Fire when I go sit on my porch to read is that I can easily check my email or look stuff up on the web. I don't have an iPad or a tablet of any sort, and I hate using my iPhone for the web, so having a good browser and email capability on the Fire is very nice indeed. Especially if I'm going out of town overnight and I really don't want to bring my laptop but I do want to check my email and perhaps do a little browsing. For my needs, the Fire is a passable substitute for a tablet. If it had 3G, it would be a very good substitute for a tablet, but because it's wi-fi only, it's merely a passable substitute. The downside to the Fire's web capability is that it's too easy to get distracted from what I bought the Kindle for: reading. 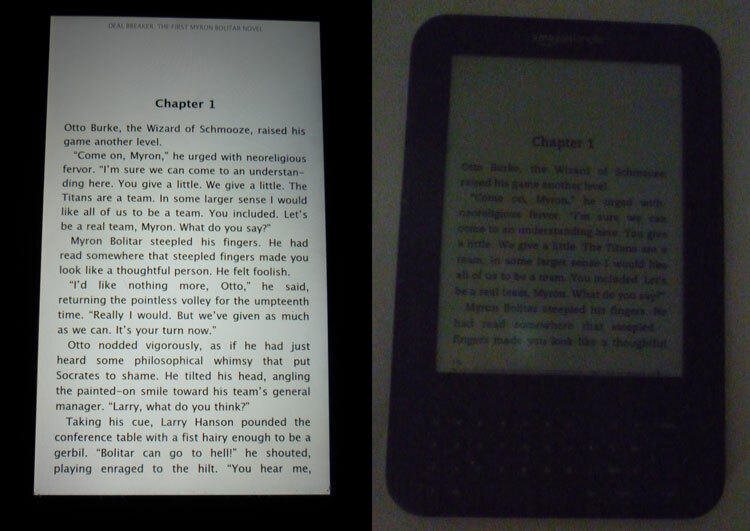 With the Kindle Keyboard, I start reading and I get lost in the book and I can read for hours and nothing distracts me. With the Fire, my email and Facebook and other distractions always seem to be calling to me. When I'm in the middle of a good book and I just want to read, I reach for the Kindle Keyboard. When I'm in the mood for distractions and multi-tasking, I grab the Fire. If I actually need to be able to check my email, definitely the Fire. The Kindle Fire can stream video and music. That means that I might actually make use of the free streaming videos that I can get through my Amazon Prime membership. Especially once my new elliptical trainer arrives and I need entertainment while exercising. I haven't played any games on either device, but I have no doubt that games are better on the Fire. There are some pretty cool-looking games in Amazon's Kindle App Store that would probably be great on the Fire, if I was into that sort of thing. Before I babysat my 2-year-old grandson recently, I downloaded some children's books to the Fire. He greatly enjoyed being read to, and he liked swiping to turn the pages, too. The books are in full color, with bright drawings and graphics to engage children. I don't think he would much enjoy the Kindle Keyboard. The Fire needs to be recharged pretty much every day. If I leave the wi-fi turned on the entire time I'm reading, it can drain the battery in a few hours. Since the Fire always makes me check my email and Facebook while I'm reading, I do tend to leave the wi-fi on. The Kindle Keyboard goes for days between charges, even when I forget and leave the wi-fi on. Obviously it takes a lot more juice to power that backlit screen, and accessing email or the web uses a lot of juice too. I'm glad I have both the Keyboard and the Fire. I like both, and I use both — at different times for different purposes. As a dedicated e-reader, the Kindle Keyboard wins, hands down. As a pseudo-tablet for someone that doesn't need all the capabilities of a full-blown tablet, the Fire wins. If I had to pick just one or the other, I'd probably go with the Kindle Keyboard. Amazon Kindle Fire HD 2013 P48WVB4 7" tablet 8GB Dual cord ,black. Amazon Kindle Fire - (Live Demo Unit) 8GB, Wi-Fi, 7in - Black - SV98LN See Pics!